How do we know anthropomorphic global warming is happening? Isn’t the Greenhouse effect a good thing? Doesn’t CO2 in the atmosphere keep the earth at a livable temperature? Since plants need CO2 for photosynthesis, isn’t more CO2 in the atmosphere a good thing - more plants? Wouldn’t that help because bigger plants will absorb more carbon dioxide? Why Are Our Winters Getting Colder? CO2 and the other greenhouse gases make up only a small part of our atmosphere. How can they possibly have that great an effect? Water is a greenhouse gas - why aren’t we trying to reduce the water in the atmosphere? Sometimes Science Has Been Wrong. Why Should We Trust It Now? Recent data shows a cooling trend, why isn’t anyone talking about that? Blame it on Nature. #1 Aren’t the changes we are seeing just natural fluctuations? Blame Nature #3:What About Earth Behavior? Blame Nature #4: How Do We Know That the Increases in CO2 Aren’t from Natural Sources – Not from Human Fossil Fuel Use? Blame Nature #5: Doesn't Nature Add More CO2 to the Atmosphere Than the Burning of Fossil Fuels? Blame Nature #6: Couldn't There Be some Natural Factors That Scientists Have Not Yet Identified? Aren't You a Hypocrite for Driving Here in an Internal Combustion Car/ or Coming in an Airplane? What About All the Coal and Oil Jobs that Will be Lost? What is the Carbon Tax or Carbon Dividend? Aren't People Making Money Off this Idea of "Climate Change?" 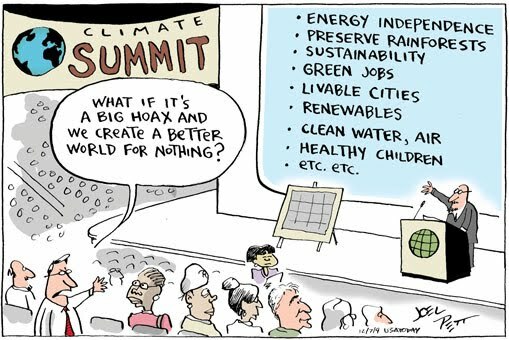 Understanding Climate change, Global Warming, Climate Crisis/Disruption, whatever you call it, can seem seem daunting. In one sense it is. The earth is a massive. complicated ecosystem where all parts are interrelated in untold, confusing ways. Sorting it out can be challenging for the best scientists. On the other hand, this crisis is is a result of well know scientific principles that are basically simple. They can be understood by all of us even without a PhD in meteorology. Predicting the exact nature of future events right now involves thousands of highly trained specialists. But understanding the causes, and solutions is not that difficult. This blog is intended to address many of the questions that frequently come up. Carbon Dioxide (as well as other green house gases) holds heat in the atmosphere. This was first demonstrated in the mid 19th century and has been verified countless times since. Humans, are adding more carbon dioxide into the atmosphere than natural processes can remove. Burning of fossil fuels is adding an additional 30 to 40 gigatons of carbon dioxide every year. This additional CO2 is doing what CO2 does. It is warming the atmosphere the oceans and the planet in general. There is disagreement about how quickly the effects are occurring, how severe they will be, and how to address them. But the data are so overwhelming and clear that the vast majority of atmospheric, ocean and earth scientists (over 95 percent) agree the effects, will be severe, and action must be taken. This is not political. It has nothing to do with political parties. This is science and it is clear. Politics comes into play as we determine the most effective ways to adjust to this growing crisis, the inevitable changes that are coming, and the best course to a fossil fuel free, clean energy future. Indeed, it does. Without the greenhouse effect, and GHG’s, the earth would be too cold for life as we know it to have evolved. However, too much of a good thing is not a good thing. That could not be more true than with carbon dioxide in our air. We are putting in more than can be removed by natural processes of life – primarily photosynthesis – and it is building up. Hence, heat is increasing beyond the relative stability we have enjoyed for hundreds of thousands of years. This is a good question and actually fairly complicated. This suggestion assumes that if a certain amount of something is good, more must be better. Is this true for food? Water? Medicines? Chlorine in your swimming pool? We know the greenhouse effect is good, we also know a rapid increase in it is not. All plants alive today have adapted to and evolved in a atmosphere with between 180 and 300ppm carbon dioxide. The problem with the quantity of photosynthesizes on the planet is not lack of CO2 but lack of plant life due to deforestation on earth. In addition, pollution of the oceans is reducing sources of sea photosynthesis. Even if we had some miraculous growth burst in plant life, it could never begin to absorb the large amounts of CO2 we are adding to the atmosphere. Further, any gains would pale next to the negative consequences of global warming. They aren't everywhere. Some places are experiencing warmer winters. There remains an overall increase in temperature of the planet, both winter and summer. Global warming is not evenly spread over the planet or over time. However, there is no denying that in some places in the northern hemisphere, winters have been sometime colder and seem to last longer. This is consistent with the global warming that is affecting all the planetary systems. The arctic is actually warming at about twice the rate of the rest of the earth. (Its still cold , just not as cold and getting warmer). This affects the jet stream which is the wavy river of air surrounding the arctic. This "waviness" and the speed with which the stream moves is what drives weather events in the northern hemisphere. The warmer temperatures in the arctic are causing something called "Arctic Amplification." One result of that is that both the size of the waves of the stream is increased (it dips higher and lower than has been the case,) and its motion is slowed down. This results in the cold temperatures from the arctic dipping further down toward the equator, and storms and weather that last longer, not moving on as quickly. There is some suggestion that as the arctic warms we will see, for a time, cooler temperatures in parts of Europe. This phenomenon requires more investigation. It does point out how our life support systems and global cycles are being affected dramatically by what are still relatively small temperatures changes. In the 1800's, with breathtaking speed, humanity took a leap of faith into parts unknown, places it could not even imagine. Four rapid-fire revolutions occurred bringing unprecedented changes that continue to affect every aspect of our lives—how we eat, how we work, how we play, what we own, how we travel, how we relate to each other, and the dangers we face. Any one of these revolutions would have increased global energy use dramatically. It all began innocently enough. Coal mining in the1700s was an onerous occupation. Deep in the ground, it was dirty and dangerous, and wet, as caves flooded and miners had to slog through water. In 1712 an Englishman by the name of Thomas Newcomen invented a steam-driven pump to remove the water. It ran by using coal to boil water and forcing steam into a cylinder which moved a piston. Clever, crude, and inefficient—it did the job. Fifty years later a congenial young man, engineer, and scientific instrument maker was asked to repair one of Newcomen’s pumps. Recognizing the inefficiency of the system, he set out to improve upon it. James Watt ultimately came up with a far more efficient engine which could be used for more than just pumping. By attaching a series of levers to the moving piston, he could make a wheel rotate. Once coal could be effectively used to make things go around, the industrial revolution was launched. By the turn of the century manufacturing was moving out of homes and into large factories filled with steam powered machinery. All kinds of goods from textiles, to machine parts, to furniture, could be built faster and far cheaper than by hand. Trains, ships, and agricultural tools became powered by steam engines, run on coal. Coal was beginning to be used in unprecedented quantities, unimaginable even a few decades earlier. Coal smoke, including particulates and CO2, was being emitted into the air, darkening cities; a new substance called Smog (Smoke + fog) hung in the air. London was famous for its “pea-soup” smogs—the most serious of which was in 1952 when 12,000 people are estimated to have died. A consumer culture, so artfully represented in Any Warhol’s art, was born, beginning in England and Europe and, over time, spreading around the world. The consumption of larger and larger quantities of stuff, made cheap by manufacturing has brought with it a tremendous increase in the use of coal. Innovation in manufacturing has continued unabated, with increasing fossil fuels use. Travel became cheaper, more comfortable, more affordable, and more frequently used. In the mid-1800s a technique was developed to extract kerosene from crude oil. Kerosene rapidly replaced whale oil, which was expensive and didn’t burn as well, to light homes. Within a few decades the industry exploded with the main player being John D. Rockefeller’s Standard Oil. Just when it looked like the oil industry was unstoppable, Edison’s electric lamp threatened its existence. Within a decade, however, the internal combustion engine that ran off of another refined oil product—gasoline—gave rise to Henry Ford’s mass produced automobiles. And oil became the fossil fuel of choice, even eclipsing the amount of coal used. Humans have always been fascinated by, and afraid of, lightning. We all know about Benjamin Franklin’s foolish experiment with the kite and a key, he was lucky to live through it. But he did establish that lightning was the same thing as the electricity being observed within various laboratories at the time. Until the middle of the 19thcentury, it was primarily an interesting play thing for the gentrified scientists. Try as they might, they had problems coming up with a practical use for the stuff. In 1879 Thomas Edison literally brought electricity home with his carbon filament light bulb. Electricity became useful and practical. Today we use electricity for everything from cruise ships to tooth brushes, leaf blowers to elevators. We heat, make ice, and light up our cities to the point that many of us rarely see a truly star-filled night. Humans use electricity for unending entertainment and can’t imagine a world without a constant supply. Tom Edison was a smart guy, but there is no way he could have foretold how his little light bulb would affect human culture and society. Electricity is generated around the world, for the most part, from the energy contained in coal. Vast quantities of coal are combusted releasing enormous amounts of chemical potential energy and equally enormous quantities of CO2 enter the atmosphere. The movement to a fossil fuel society has not been cheap. Drilling, mining, transportation—including pipelines, ships, trains, and trucking—refinement, gas stations and newer enhanced techniques of extraction (fracking etc.) represent an investment of trillions of dollars at today’s rate by both the private and public sectors over the last 150 years. Industrialization and electrification is now so ubiquitous that it is hard to imagine meeting our needs with things produced any other way. James Watt, in the 19thcentury, had two wives, the first dying in childbirth at a young age. With her he had 5 children. His second marriage yielded 2 children. Of his 7 children, 3 lived to adulthood. To lose the majority of one’s children, even for the relatively well-off, was not unusual. Neither was death in childbirth. There was one more major social transformation to come that, even more than industrialization and electrification, has increased worldwide use of fossil fuels - the germ theory of disease. inspired a health revolution. Now we could fight back against maladies that had plagued mankind since before Lucy walked on two legs. Average life expectancy has doubled since 1850. Better distribution of food and the industrial revolution itself can account for some of this increase. But most of it can be credited to effective vaccines, antibiotics, and control of disease vectors that came from an understanding of microbiological causes of disease. This has curtailed nature’s abilities to keep our population in check. Suddenly we have unprecedented population growth. World population was 1.2 billion in 1850. Today, 117 years later it is 7.5 billion people, 6 times as many, and it continues to grow. Further, people in nations who have not enjoyed the benefits of our energy gluttony are lining up to join in. More people, wanting the stuff, conveniences, and transportation offered by the industrial revolution, means increased demands for energy. GHGs are indeed trace, being measured in parts per million and parts per billion. That, however is enough. 180 to 300 ppm has been adequate to keep our earth at a comfortable living temperature, rather than the icy world that would be expected otherwise. The higher levels correlate with higher temperatures both historically, and currently. Ours sister planet, Venus, which has an atmosphere that is primarily carbon dioxide, holds huge amounts of heat in the atmosphere and, not that anyone has tried it, we are told lead would melt on its surface. The amount of water (humidity) varies from place to place, time to time. Water remains in the atmosphere for a relatively short time, unlike excess carbon dioxide which can remain for centuries. But human activity is putting water in the atmosphere indirectly, by the increased heat caused by increased CO2. This is a feedback loop. As we put carbon dioxide in the air, temperatures rise which cause more evaporation of water, further increasing temperatures. The only way to reduce or stabilize this GHG, water, is to reduce or stabilize temperature. That takes us back to CO2 emissions. Tipping points are consequences of the consequences. They are the feedback loops, where the heating takes on life of its own without help from humanity. When this kicks in, and scientists don’t know when, even the most drastic energy austerity will not be enough to stop continued heating of the earth. Global warming will be off the reservation, feeding itself. Snow and ice is white which reflects sunlight back into space. As the ice of the North Pole is replaced with dark ocean water, more heat is absorbed by the ocean. Likewise, the reduction of glaciers, snow on mountains etc. means less radiation is reflected, heating is increased.Snow and ice reflect nearly 90 per cent of incoming radiation and are important to keeping the earth cool. As the atmosphere warms, more water is evaporated and held in the air - humidity. While this is one of the factors driving more extreme storms, water vapor is also a greenhouse gas, thereby trapping still more heat in the atmosphere. The heating of the oceans, as well as other kinds of pollution, is reducing the abilities of the oceans to photosynthesize. This means less CO2 is removed from the atmosphere and oceans and results in still more warming of the atmosphere and oceans. There is something called Arctic Methane emissions. As permafrost (ground that heretofore has been frozen) melts, and glaciers in the arctic ice recede, methane and additional CO2 is released into the atmosphere. Part of this is just stored gases, part of it is a result of rotting biomass that was previously frozen. As the earth warms, more of these gases are released. More GHG, more warming the earth. It is this kind of runaway greenhouse effect that is the scariest, threatens the livability of the planet in the future, and keeps climate scientists up at night. You trust science all the time. When you fly in an airplane, take a medicine, ride in a car, use your computer, take an elevator etc. etc. etc. Our modern world is built on the findings and conclusions of science and you can trust them. The willingness of science to be wrong is the most powerful tool it has in the search for truth, and what separates it from opinion and belief. Science is self-correcting. Part of the scientific process is the search for “chinks in the armor,” so to speak. The frequently used term “peer -review” means that research and conclusions are published and subjected to evaluation of others in the field. Does it hold- up to scrutiny? Can others repeat your work with the same results? Basically, everyone is permitted to take pot shots at your efforts. Scientists are born skeptics, questioning and doubting. If your data holds up through this process, you may be on to something. Can Scientists Ever Be Sure? One might be inclined to suggest that if scientists must always be open to the possibility of being wrong, how can they be definite of anything? The answer lies in the volume and quality of evidence. In the mid twentieth century there were increasing numbers of individuals that were concerned with the possibility of global warming. They knew that carbon dioxide in the atmosphere was how the earth stayed at living temperatures, and it was obvious that we were, even then, adding additional unnatural amounts of CO2 to our air. It seemed likely that this could increase the greenhouse effect beyond current levels. Interestingly, at the same time, there was a hypothesis that more powerful forces might indicate some cooling of the planet. There was disagreement because there was not enough data to be certain. Nor was there the evidence to project what the consequences of this warming (or cooling) could be. Fast forward several decades and the amount of evidence from a variety of sources is staggering. New technologies and a dedication of resources to the problem have clearly shown rising temperatures, delineated consequences, identified the increase in CO2 to be from fossil fuels. Today we can even study the climate and CO2 levels far back in time to further understand our world. The evidence all points in one direction, and the reality of global warming has emerged as definite as anything science has determined including the elliptical shape of the earth’s orbit , the existence of radio-waves, or the reliability of gravity. We must be open to the possibility that some new piece of information will prove us all wrong and somehow account for all the changes we are seeing on earth. However, at this point, the evidence is so overwhelming that to ignore it would be like driving your car with your kids unbelted in the front seat, full speed into a massive stone wall because you think maybe the wall is an illusion. You want to bet your life on it? Vigorously searching out and accepting where one is wrong, is a necessary step in achieving truth and reality. It is also, paradoxically, the best way to be certain of conclusions. The scientific process does this well. There has not be a cooling “trend.” Earth temperatures are variable, some areas and some years are warmer or cooler than others, this has always been the case. There are normal.fluctuations but the overall average temperature has been consistently up. The last five years have seen the warmest average temperatures for all time. Some are, yes. There are natural fluctuations in CO2 content and temperature and these are seen as a jagged line graphs of these measurements. These fluctuations are a result of many natural factors including seasons, sunspot cycles etc. However, also obvious on these graphs is constant upward averagetemperature. This is not from natural causes. It is faster than anything that has occurred in since humans first appeared on the planet. This is a result of additional heat being held in the atmosphere due to the rapid emitting of greenhouse gases – primarily CO2. Another natural cycle is the Dansgaard-Oeschger events which scientists have identified from ice core data. (Extra points for being able to pronounce it). These events are not well understood: they seem to happen about every 1500 years and bring about a fairly fast warming of the Northern Hemisphere. This looks like a possible culprit - except for a couple of details. First, the last D-O event occurred about a thousand years ago. So we aren’t due for another 5 centuries. More important, however, is that D-O is a re-distribution of temperature, not an overall increase in global heat. The northern hemisphere gets warmer, the southern gets correspondingly cooler. We are experiencing a warming of the entire planet. Yes, the planet does wobble, moving one way and then back again on its axis by a fewdegrees, every year and a half or so. This is primarily due to tides and the gravitational pull of the moon and the sun. Here again, any change in temperature or climate on the part of the earth tilting a bit more toward the sun, is offset by reverse changes on the part tilting away. This is not an overall global warming like we are seeing. Interestingly, there is some strong speculation that the wobble may be increasing a little because of climate change. It is being suggested that the melting of the ice at the poles and redistributing of water may be changing the wobble. age old wobble can account for the consistent global warming we are seeing. The bulk of the carbon on the planet is held in rocks and inorganic materials so this theoretically might have some merit. Consider this: emissions from Mount Pinatubo, the strongest volcanic eruption over the past 50 years, amounted to just 0.2 percent of human emissions in 1991. Just 0.2 percent! On the other hand, we’re releasing around 35 billion metric tons of carbon dioxide into the atmosphere each year. This number equates to more than 100 times morecarbon dioxide released into the air than volcanoes. If that sounds like a lot, that’s because it is – and it makes usthe main drivers of climate change. Could it be that the CO2 we are seeing is from large rock deterioration, or gases somehow seeping up through the crust of the planet? Maybe it is coming in from asteroids? Alas, this won’t fly. Human fingerprints are all over the increasing amounts of CO2 we are seeing in the atmosphere. One of the most important fingerprints is from the study of carbon itself. This is a little tricky, hang in there. Carbon comes, basically, in three flavors (called “Isotopes”), depending upon how many neutrons an atom has in its nucleus. All carbon atoms have 6 protons in the nucleus. The majority of carbon atoms also have 6 neutrons. We call this type of carbon “carbon-12” (12C). There are also carbon atoms that have 7 neutrons, called “carbon-13” (13C). And carbon atoms with 8 neutrons are called “carbon-14” (14C). Most of us have heard about 14C because it is radioactive and is used in dating organic materials. This is a story about 12C and 13C. Plants prefer the lighter 12C to 13C. Therefore, they have a larger proportion of 12C to 13C in their structures, than is found overall in nature. So do you, since the carbon in your body came from plants. And, here is the kicker, so do fossil fuels because that carbon also came through plants, long ago. And . . . so does the carbon dioxide that we are measuring in the air. As the CO2 increases in the atmosphere, the ratio of 12C to 13C, increases, demonstrating, without a doubt, that the increases in atmospheric carbon came originally from living matter, which means from fossil fuels. Busted. This is not some sort of rock off-gassing, volcanic eruptions, or contributions from some celestial source. This CO2 has come from ancient plant matter. It's the proverbial smoking gun. We can further verify the source by crunching the numbers. We know how much fossil fuel we have been burning since the mid 19thcentury, and how long it stays (several hundred years or more). It all adds up. The amount of increased CO2 in the atmosphere corresponds to the increased CO2 we have been putting there. We have our fingerprints all over this excessive CO2. Carbon dioxide is part of the great carbon cycle of the earth. Nature produces about 750 gigatons of carbon dioxide per year, but nature also removes about 750 gigatons of CO2 yearly primarily through photosynthesis. The 29 gigatons (actually some put that number at closer to 40 gigatons) burned by human activities is in addition to what nature produces, and is beyond what he natural carbon cycle can remove. Hence, carbon dioxide is accumulating in our atmosphere and being absorbed into our oceans. The level of atmospheric CO2 is increasing every year. In addition, however, due to deforestation, and damage to flora in the oceans, nature’s ability to reclaim CO2 is actually going down. Science is never finished and one must always be open to the possibility of a heretofore unidentified natural event that may be partially responsible for the warming we are seeing. However, as we understand more and more about the changes in our atmosphere, the importance of this hypothetical natural cause becomes vanishingly small. The effects we see line up with the increases in CO2 and other GHG emissions we are measuring. Any unrecognized enhancing or mitigating natural process is playing only a very small part. Change is difficult, and we would all prefer to not change. But seeking out illusive and unlikely causes for our current climate crisis rather than taking solid and do-able action is a recipe for disaster.